If you can’t beat ’em, you might as well join ’em! Fidget spinners are all the rage, not to mention the bane of most teachers! However, if students are interested in them, why not use them as part of an educational activity? Below you will find two review resources that use spinners to help students learn common kitchen measuring abbreviations, conversions and tools. If not all of your students have access to fidget spinners and you don’t want to actually purchase these devices, there is a free app you can utilize in order to take advantage of this, hopefully, short-lived fad. In the meantime, use it in a constructive way to help keep students engaged and attentive! The premise of these review activities is that you have already taught the materials to students. The review activities can be used as bell ringers or activities for early finishers or simply as a review activity before a quiz or test. 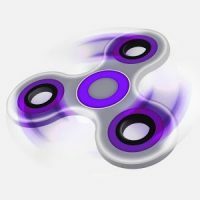 If using actual spinners–students simply place the fidget spinner on top of the icon and give it a spin. They are to see how many of the items they can complete before the spinner stops. Students can continue to improve their scores. If using the free app–students simply swipe the spinner on the app and see how many of the items they can complete before the spinner stops. Again, they can try to improve their scores.